Originated and sponsored by American Express, the Small Business Saturday ® is an annual event that sits between Black Friday and Cyber Monday annually. It is dedicated to driving sales to small businesses on one of the busiest holiday shopping weekends of the year. It is the day the nation celebrates the Shop Small® movement and supports the small businesses that help fuel the economy and invigorate communities. 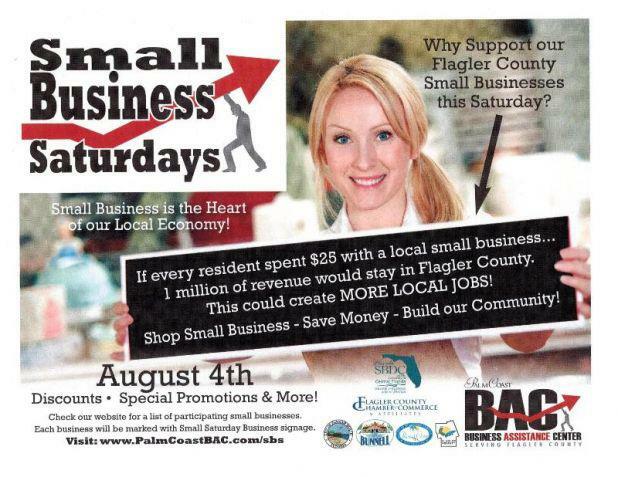 Inspired by this movement, and determining the need to drive business to the small businesses located in Flagler County, City of Palm Coast and the Palm Coast Business Assistance Center came up with a monthly version, called Small Business Saturdays in Flagler County. The goal is to get the small business owners in Flagler County to offer significant specials and discounts to the residents, county-wide, in Bunnell, Flagler Beach, and Palm Coast; and drive sales as well as support for the Small Business to get the local economy moving. The event will take place on the first Saturday of every month starting in August 2012. The continuation of the event is dependent on participation from the Small Business owners in the area as well as the consumers. One perk for the business owners is that there will be permissions for special event signage. Lack of signage, and strict regulations is a common complaint by business owners particularly in Palm Coast. But now, once a month, on the first Saturday a participating business can use an approved yard-sign in their private property to create awareness and drive traffic to their business. Another, and an important perk, is that the Palm Coast Business Assistance Center will advertise the participating Small Businesses free of charge! Free, is good! Good to hear Joe explain the benefit to the business as an opportunity to position their product and services to consumers in what may be in a new way for them through promotions and discounts.